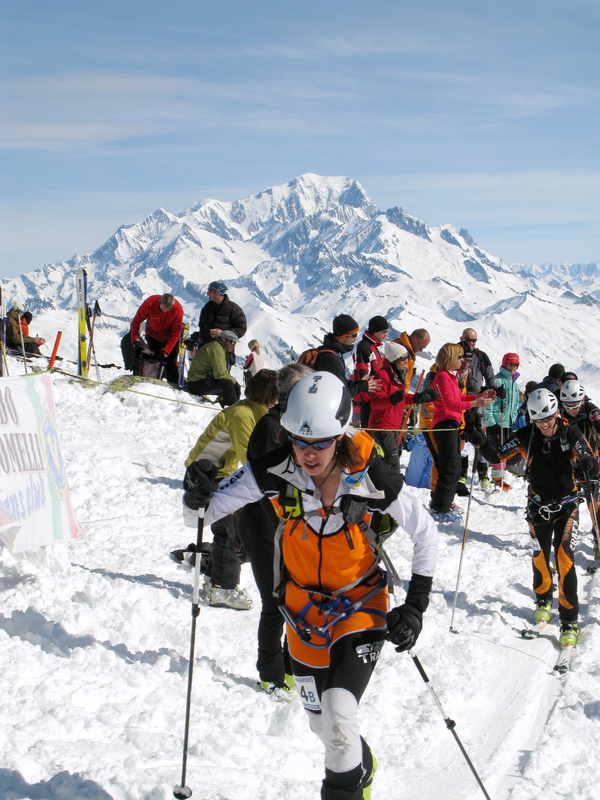 The top two Italian teams atop Le Grand Mont, just like a Tour de France stage on snow. 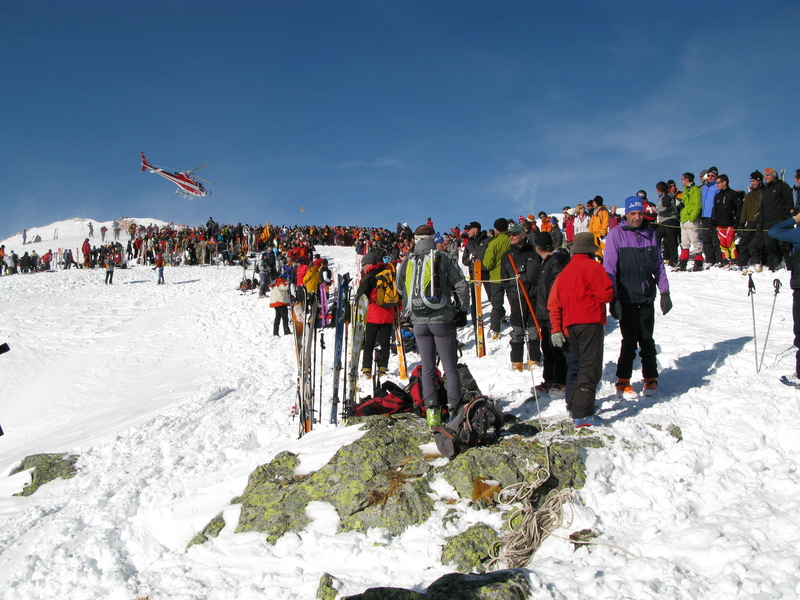 Whoever accused the French of being lazy has never been to the Pierra Menta. Today was like a Tour stage on snow. Katie and I started skinning up the Areches ski area at 6 a.m. so we could cheer on the US team at the very top of the mountain, Le Grand Mont, which sits at 2,687 meters. 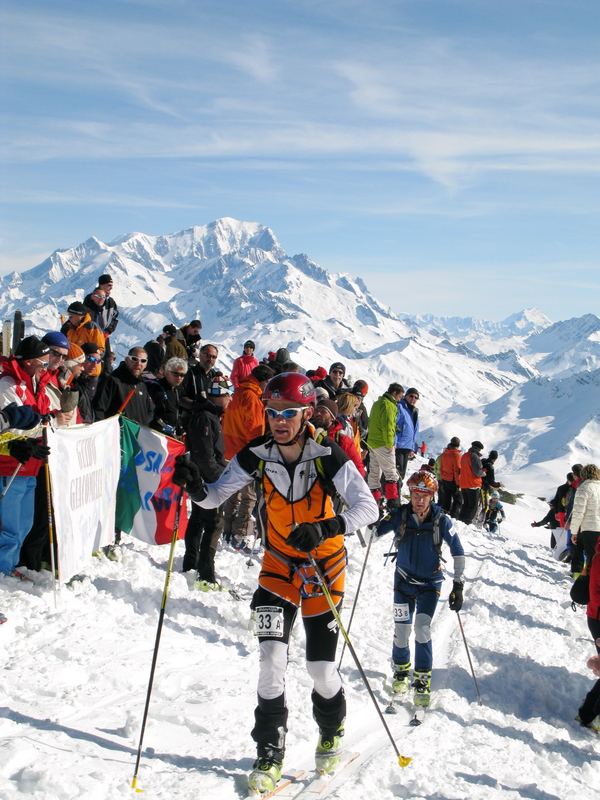 We started out with a few other spectators but before long, we were literally joined by thousands of people making their way up the mountain by every means imaginable: skis with skins, snowshoes, crampons, you name it. 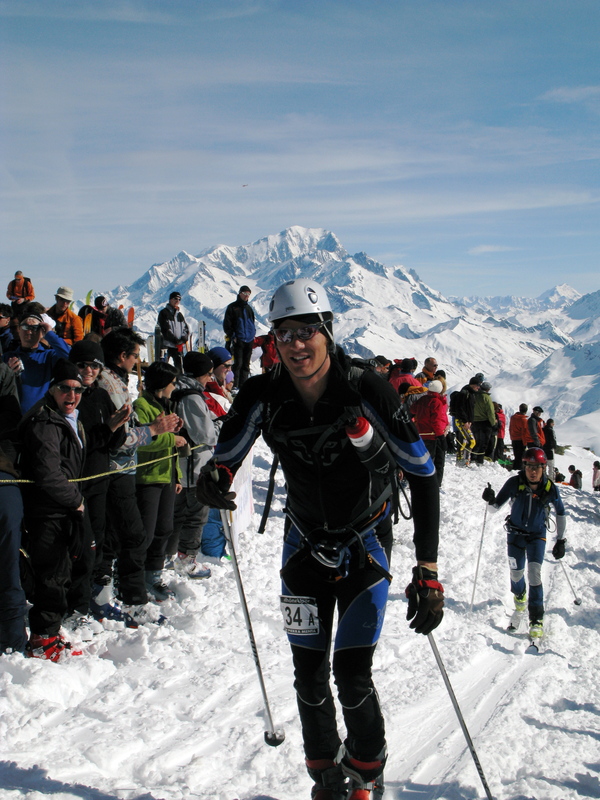 I think there were more people on ski mountaineering gear here than has been sold in the US all year. 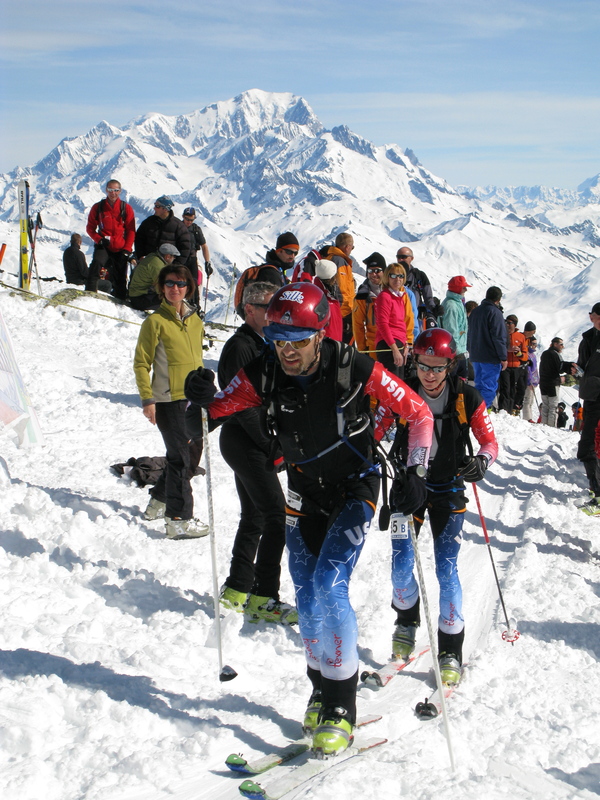 When we got to Le Grand Mont it was an awesome spectacle – thousands of people lining the course and setting up ‘tailgates’ that would make any American football fan proud, especially since everyone hiked it up over 5,000 feet. Of course, people were eating cheese and drinking hot wine instead of Cheetos and wine coolers, but the idea is the same. As each team cruised by the crowd went wild, cheering, chanting, singing and ringing insanely large cowbells. It was a thrill to be there and everyone on the US team said they got goosebumps as they skied past. It was another good day for the American team, all of whom loved the technical, dynamic nature of today’s course. 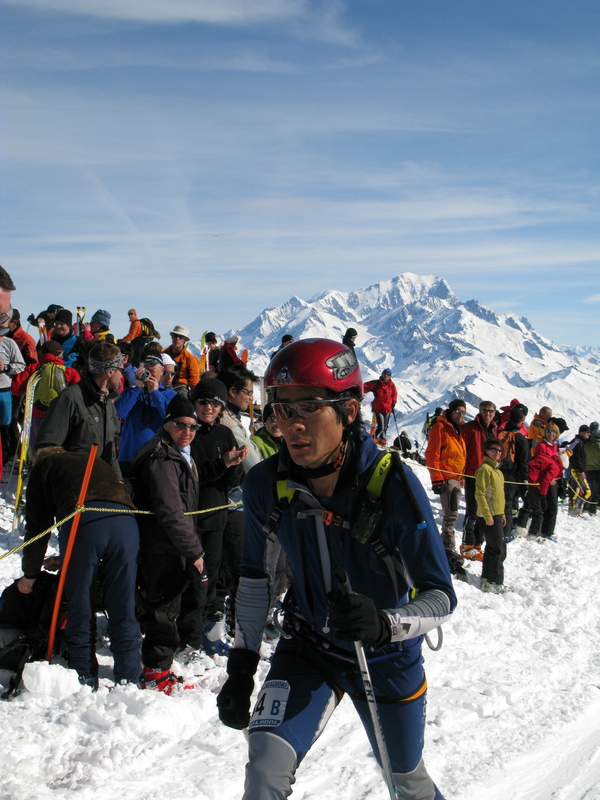 The stage included at least one super steep pitch with about 100 switchbacks and a bootpack section over an exposed ridge with a fixed line that required all the teams to clip into with their via ferrata gear. Pete and Carey had another strong day, finishing in 35th place for the day. Brandon and Jared recovered nicely and finished in 79th. Brad and Jason, ever the gentlemen, let Sari and Mona pass them at the bottlenecked bootpack section and the two teams finished one after another. Sari (who is thankfully feeling much better) and Mona finished the day in 6th place, moving them up to 7th overall. Nina and Linsay are just two minutes behind them in 8th place. Tomorrow is a short(er) day with just 5,700 feet of climbing. Then, we’re all loading up and heading to Geneva where everyone will catch flights back home. I don’t think I’ll have time to post, but I don’t think there’ll be much change in the overall standings. The Pierra Menta has been an unbelievable experience for all of us and everyone is already plotting their return next year. Thanks for reading and your support! ← Are we at least halfway there?! Awesome job Sari! So glad to hear you’re feeling better. Thanks for the updates, Ian! Thanks for the updates! What an amazing race. Wish I could be there! Say hi to the crew. Way to go Sari! I hope they figure out what is wrong with yoru stomach soon. I couldn’t have done that race feeling 120%. Quite impressive. Thanks for the great updates, Ian!